Home » Freelance Confidence » Don’t work for free – people die of exposure! 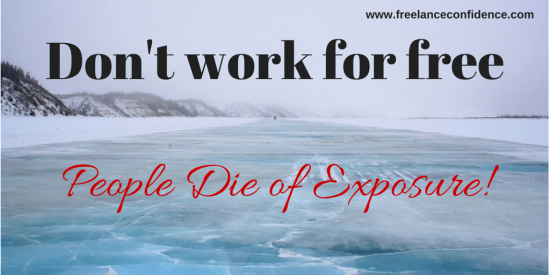 Don’t work for free – people die of exposure! When you freelance, a lot of people expect that you will be keen to write for them for free. As if you have nothing better to do with your time, as if your skills are worth £0, and as if the opportunity to populate someone’s niche blog on raw cabbage recipes will provide such impressive exposure that it will launch you into the million-dollar career you’ve always wanted. Last time I checked, British Gas don’t accept exposure in lieu of cold, hard cash when they send out their bills. None of these are good reasons to write for free, and devaluing your work only benefits those who are trying to rip you off. Guess what? There’s no well-paid work after you’ve written for free. By then, they’ll be grooming the next freelancer they find to provide their next few blog posts ‘as a trial’. Plus, do you really want to work for somebody who cares so little? Good clients are willing to invest in great-quality content. And yes, this includes paying for test pieces. If a client insists that they need to see what you’re capable of before they’ll pay you, show them your existing work. Don’t create new content from scratch for them. Who knows how many other writers are doing ‘test pieces’ for them, too? If a client hasn’t set a budget for content and yet content is part of their marketing plan, they are really bad at planning. It’s not your problem that they thought it through so poorly, and it’s certainly not up to you to provide the work they failed to plan for. Can you imagine ordering some business cards and then calling the printer asking for them for free, because you ‘hadn’t budgeted for business cards’? No business – and that includes freelance writing businesses – should be expected to work for free just because of someone else’s bad planning (or, let’s face it, their sense of entitlement). And sure, something might look great on your CV but, last time I checked, shops don’t accept impressive CVs in exchange for food. And, in any case, the people who have tried to persuade me to write for them for free with this particular argument tend to have websites that, frankly, I wouldn’t want to admit to on my CV, anyway. We’re not talking the New York Times, here. writing that is, essentially, marketing for your own business or promoting your book, e.g. guest blog posts*. *Don’t assume that guest blog posts are always unpaid, though. If you are guest blogging to drive traffic to your website or to raise awareness of your latest book, that is marketing and you can’t, generally, expect to be paid for that. If you are guest blogging to help a website build up content, that is work, and some good blogs pay for guest posts like this. The key to this whole, messy issue is to remember that the skills you offer, the experience you have built up and the knowledge you possess about your industry are worth paying for. Certain clients will move heaven and earth to get you to write for them for free, but they are to be avoided at all costs – rarely do they end up paying a decent fee for your work. Don’t die of exposure. Find the clients who value what you do and are keen to invest in great content for their publication, website, brochure etc. These are the ones to hold on to. Find out how to escape from soul-destroying content mills for good! 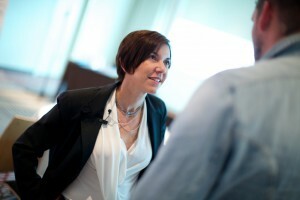 Share the post "Don’t work for free – people die of exposure!"